The leading independent specialist for windscreen replacement and windscreen repair based in Rochester and serving all of the Rochester area. National Windscreens Rochester fitting centre provides windscreen replacement and windscreen repair services to businesses and individuals throughout Rochester and the Rochester area. Rochester is situated in the east of England on the River Medway. 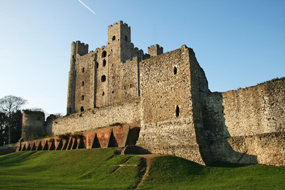 Rochester is only 30 miles from London with excellent road links provided by the M2, A2 and M26. The city is steeped in history, with its picturesque Norman Castle and Cathedral which are both popular with tourists and locals alike. There is an eclectic mix of antiques, fashion, collectables and art that can be found in the shops of Rochester making it an extremely popular destination for those looking for an enjoyable and varied shopping experience. The Rochester windscreen fitting centre and its mobile vehicle glass technicians service the needs of Rochester and the surrounding area including Gillingham, Sheerness, Strood and Sittingbourne. With 108 fitting centres and over 800 mobile technicians, National Windscreens operates the UK's largest windscreen repair and windscreen replacement network. The company provides low cost, high quality windscreen replacement and windscreen repair from its Rochester fitting centre 24 hours a day, 7 days a week, 365 days a year. Repair and replacement of all types of vehicle glass including windscreens, rear windows and side windows is undertaken throughout Rochester and all of the Rochester area.